After a 10-year run of our Nerd Watch Museum we’ve decided to upgrade. The new format allows for easier, faster content additions and better engagement from you. For posterity’s sake, we’ll preserve a copy of the original landing page. 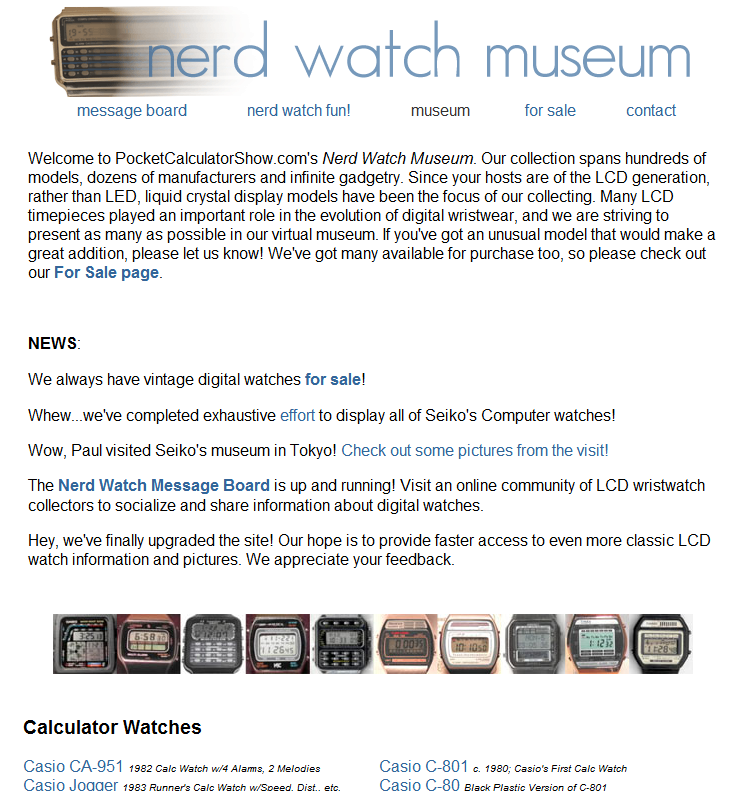 Welcome to PocketCalculatorShow.com’s Nerd Watch Museum. Our collection spans hundreds of models, dozens of manufacturers and infinite gadgetry. Since your hosts are of the LCD generation, rather than LED, liquid crystal display models have been the focus of our collecting. Many LCD timepieces played an important role in the evolution of digital wristwear, and we are striving to present as many as possible in our virtual museum. If you’ve got an unusual model that would make a great addition, please let us know! We’ve got many available for purchase too, so please check out our For Sale page.